(St. Louis, Missouri) - In the St. Louis suburb of Clayton, MDR Properties has added a second 14-story class A office complex immediately adjacent to their existing Smurfit-Stone Center office building, also 14 stories tall. They have met many of the challenges of suddenly doubling the amount of space to be managed by installing a state-of-the-art building automation and control system by KMC Controls. Managing tenant comfort levels, controlling energy costs, and easy access to building operating data were all top concerns of the building ownership and management staff. 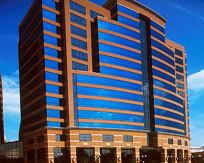 The original Smurfit-Stone Center was constructed in the mid 1980’s and uses primarily pneumatic controls. In 1999 MDR recognized that the antiquated energy management system which controlled start/stop features on their central plant was not year 2000 compliant. They chose Taycon Building Technologies of St. Louis to replace the existing system with a KMC Controls KMDigital Building Automation and Control System. The following year MDR began designing the brand new Forsyth Center facility to be located next to the original building. The success of the original retrofit project gave MDR the confidence to design a complete DDC control system for the new modern facility and once again Taycon and KMC were chosen. The controls for the new building were brought on line as individual floors were completed, allowing management to control various areas differently during construction so as to minimize utility use. Outdoor air intake, fan speed, setpoints, and other parameters on both the new and existing building could be modified at the touch of the mouse as construction conditions required. With the Forsyth Center now completed, the owners and managers of both buildings have ready access to system operations. A fully graphical user interface results in very modest HVAC experience requirements for the building management staff. They can review current conditions, floor temperatures, air handling equipment efficiency and other information by scrolling quickly through a handful of graphic representations of the building equipment and floor plans. With nearly 300 zones in the Forsyth building alone, instant access to airflow and temperature data in every zone saves hours of time investigating problems or complaints. DDC control of the central equipment means that only the amount of cool air required is provided the terminal units for the offices, thus keeping operational costs to a minimum without sacrificing tenant comfort. The digital hardware sends an alarm to the operator workstation if there is an equipment malfunction, and sends a pager alarm to the building manager during an after-hours critical failure. A Saturday afternoon failure can be identified and corrected long before tenants arrive at the building on Monday morning. The KMDigital system is integrated into the building access system (also installed by Taycon), allowing for after-hours override of space comfort levels by tenants. It also controls all the lighting in the building. The KMC system puts the HVAC equipment in setback mode, and cycles the lighting off after normal building operating hours. When a tenant uses their access card to enter the building after hours, the KMC system restores the lights and HVAC operation in their portion of the building. The system then records who overrode the building and when, thus allowing MDR to invoice tenants for after-hours energy consumption according to their lease.